Purchase Annual Percentage Rate (APR) | Of course, you hope to qualify for a card at 0 percent by having a decent credit score. I’ve been told being in the 700 Club is good. I assume lenders don’t want to do business with you if you’re opening up cards left and right. The expiration date for the teaser (introductory) rate | It could be 6 months, 12 months or longer. You don’t want to get caught up and not pay your balance within that timeframe like me. After that time’s up, the interest rate jumps up significantly. A card I once considered chose between 12.99 percent and 22.99 percent depending on the card applicant’s creditworthiness. Balance transfer fee | Some cards charge a percentage of the balance you wish to transfer to the new card. For example, if you have a 3 percent fee, you would pay $30 for a card with a $1,000 balance. The lender | While looking around, I noticed that you can’t get do a balance transfer within the same company. So example, you can’t dump debt from one Chase card onto a second Chase card. Savings from not paying interest | Using this balance transfer calculator, I estimated that I could save $762 in interest over the duration of the promotion. Seeing the amount of money you’ll save might give you extra motivation to pay off this card quicker. Impact on credit score | Your score might drop. Payback plan |This is the most important factor. Transferring your balance won’t do you any good if you don’t pay it back in time. Get it in your head right now that you won’t add more debt to this card and you’ll do whatever it takes to pay this card in full before the 0 percent promotion ends. If you plan to apply for credit such as a loan or mortgage in the near future, then some folks advise against doing a balance transfer. Why? A balance transfer could negatively impact credit scores in three ways. Debt utilization (30 percent of your FICO score) | You could max out the balance transfer card. The rule of thumb is to use 30 percent or less of a card’s credit limit. Maxing out at 100% is not good. Opening new credit (10 percent of your FICO score) | Opening new accounts could lower your score. Lenders don’t want to see that you apply for new credit often. That’s risky. Length of credit history (10 percent of your FICO score) | The longer you have a credit line, the better. 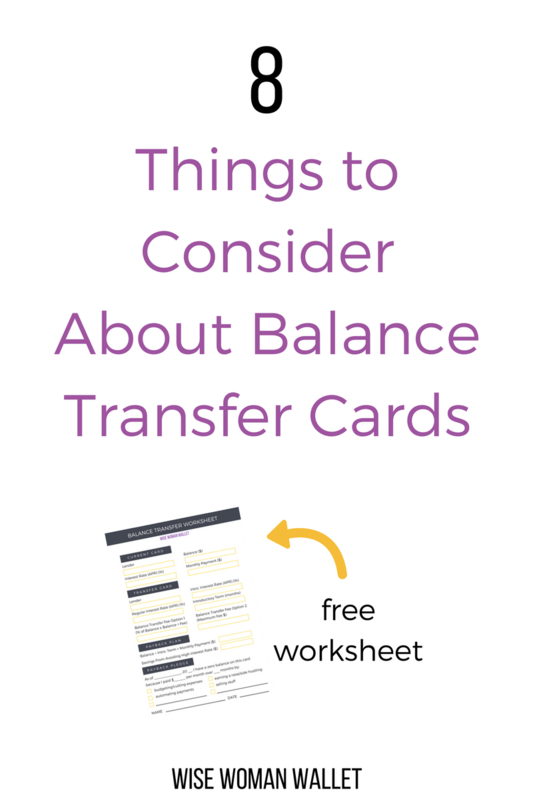 Please check out my comprehensive Balance Transfer Worksheet to (1) help you figure out if you want to get a balance transfer and (2) make a plan to pay it back before the low-interest rate period expires. What do you think about balance transfers? Was the worksheet helpful? Tell me what you think in the Comments Section.